Fig. 1. 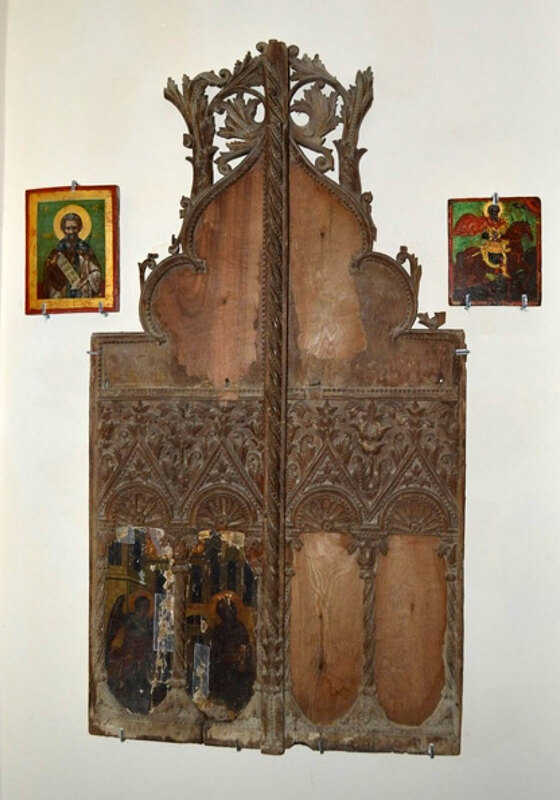 View of exhibition with icons from the church of Aghia Zone in Ammochostos/Famagusta, 16th century. In 1974, Turkey invaded Cyprus, taking over 37% of the territory of the Cypriot Democracy and ousting 200,000 Cypriots from their ancestral homes. The policy of Turkey and of those forcibly transferred by it in the occupied north is to “turkicise” these areas. This is achieved both by bringing in a massive number of settlers from Anatolia, by the island’s simultaneous demographic change, the replacement of the ancient place names by Turkish ones and, in general, by the destruction of any element related to the island’s Greek cultural identity. From very early on, this was the reason that an organized effort was made to pillage archaeological sites, museums and libraries. More than five hundred churches suffered pillaging, vandalism and were subjected to all sorts of uses alien to them. 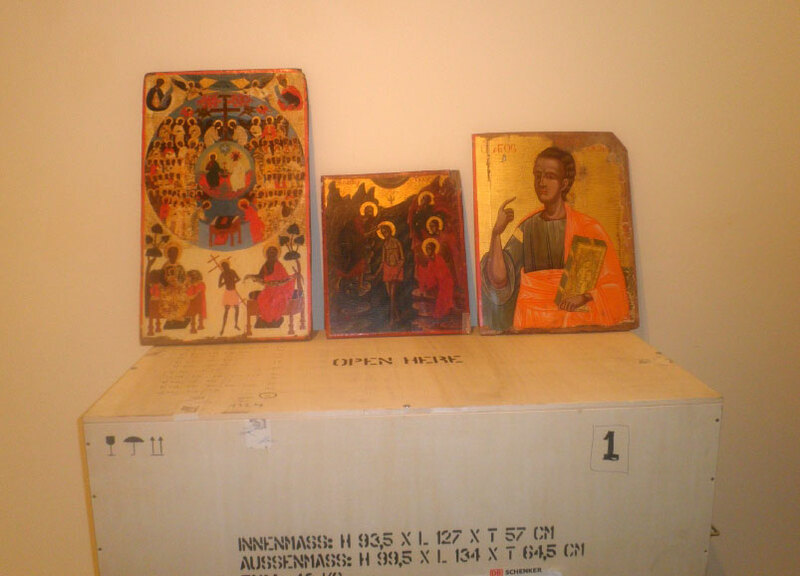 15,000-20,000 icons were stolen, along with holy vessels, ecclesiastical vestments and manuscripts. 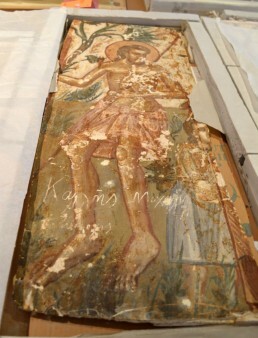 Dozens of both wall paintings and mosaics were cut in pieces and sold abroad while others have been completely destroyed as, for example, the mosaic in the church of The Virgin, Our Lady (Panagia Kyra), near the village of Leivadia in Famagusta. The catastrophe is not restricted just to Orthodox churches but also to churches of all creeds on the island such as Armenian, Maronite, Roman Catholic and Protestant as well as Jewish synagogues. Old churches of exceptional archaeological value disappeared either because of natural damage or due to human intervention. 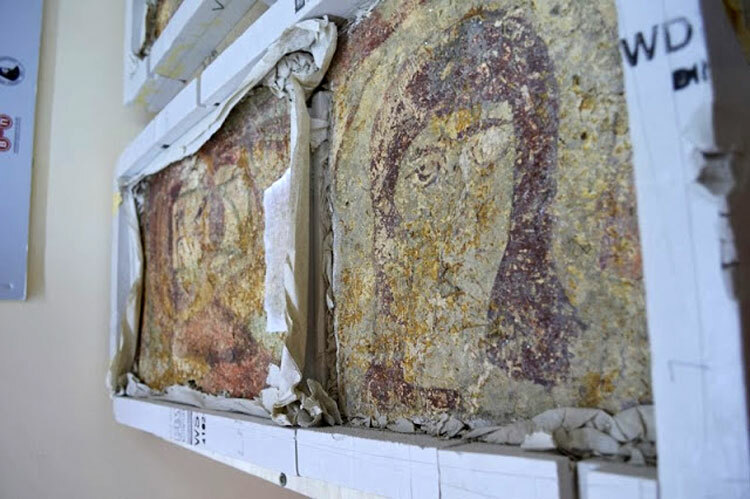 Such is the case of Panagia Avgasida in Milia, with 15th century wall paintings pulled down by the regime of occupation fifteen years after the Turkish invasion, or like the church of St Catherine in Gerani, which was knocked down just a little while ago. An important piece of the world’s cultural heritage is vanishing and is sending out distress signals internationally. 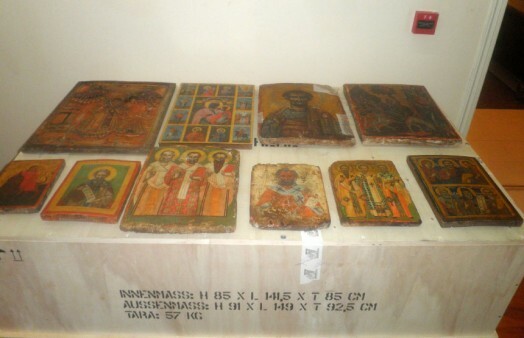 Since 1974, with the situation being out of control, networks for the smuggling of antiquities developed in the Turkish occupied northern part of Cyprus, aiming to sell off the cultural heritage of Cyprus. With the help and encouragement of the Turkish army, smuggling yielded large profits to those involved, since treasures from Cyprus are already part of private collections in many countries of the world such as Turkey, Russia, Switzerland, Holland and England and as far as the USA, Australia and Japan. Aydin Dikmen is still the most well known smuggler of antiquities with the greatest connections. He had collaborators both in Turkey and the occupied territory as well as in Europe and the USA. 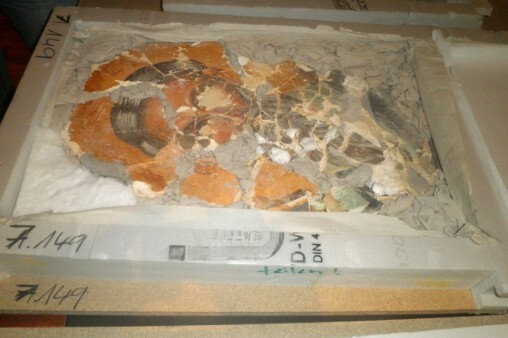 Moreover, his activities involve him in the biggest and most well known scandals in the smuggling of Cypriot treasures. He channelled his loot, taken from the occupied zone via Turkey, all over the world, having Munich as his headquarters. 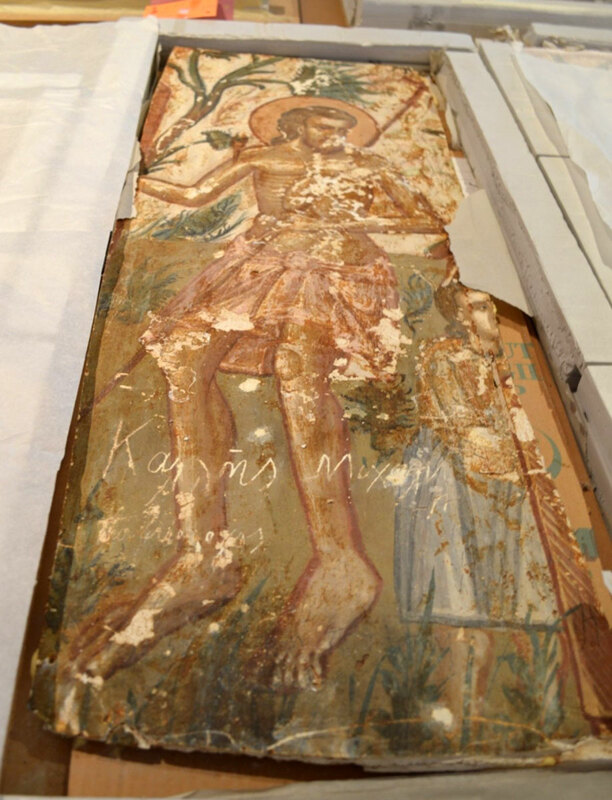 One of the biggest cases of smuggling Aydin Dikmen has been involved in is the plundering of the wall paintings from the church of St Eufemianos in Lyse as well as the 6th century wall mosaics from the church of the Panagia Kanakarias in Lythragome. These cases lead Interpol and the German police on the tracks of Aydin Dikmen. In October and November of 1997, they raided the flats kept by the Turkish smuggler in Munich. 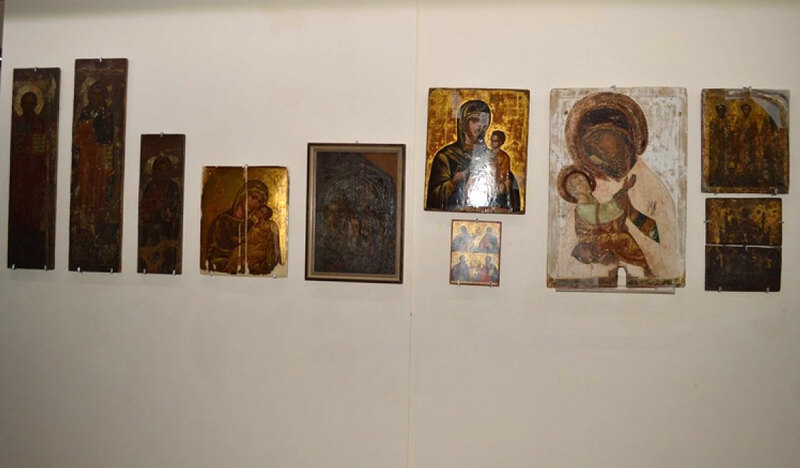 The number of works of art discovered there is shocking: These are artefacts from approximately 50 looted churches in occupied Cyprus, which have been completely identified, while unfortunately, due to a lack of archives, there is not sufficient evidence of their identity. From among the well known works of art, the following stand out: pieces of 6th century mosaics from Panagia Kanakaria, fragments of wall paintings from Panagia Apsinthiotissa in Synhari such as the head of St Ignatius, fragments of wall paintings from the church of Panagia Pergameniotissa in Akanthou dating from the 12th century, fragments of wall paintings from the 9th century church of St Solomone and fragments of wall paintings from the church of the Antifonetes ( around 1200 and of the end of the 15th century) as well as a large number of icons and old manuscripts. There can be no doubt that the German Police’s raid in Munich happened too late, as it is thought that a huge number of other treasures had already been passed on to the illegal Art market. Files kept by the Turkish smuggler of antiquities have been submitted as proof to the Law courts of Bavaria. 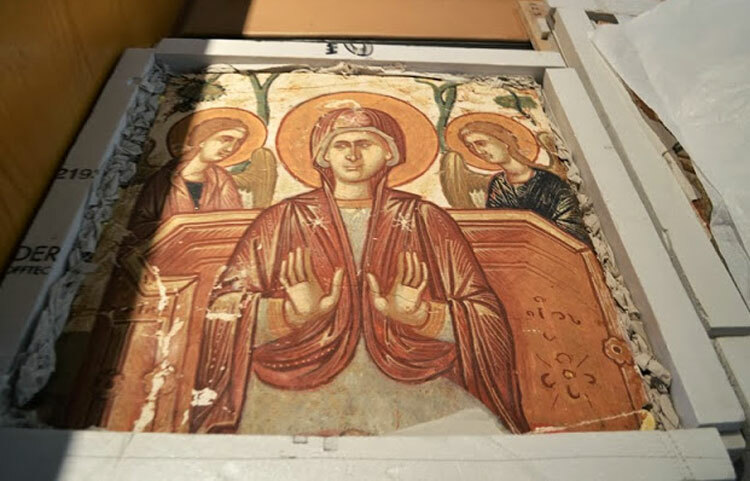 The details in these archives are phenomenal; photographs and sketches before, during and after the theft of the mosaics and wall paintings, as well as copies of the mosaics to be sold as originals in the illegal trading of antiquities. The false certificates held by him exclusively for the copies are sufficient evidence of a well organized crime. The German Law courts tried the case seven years later in 2004 and ruled that evidence on the part of the Cypriot Democracy regarding the appropriated antiquities was not sufficient for the total number of artefacts. It would, moreover, have been impossible for the Church of Cyprus, up to 1974, to have photographed one by one as evidence, all the wall paintings, mosaics, manuscripts, the incunabula and the holy vessels from the churches plundered by the antiquities smugglers. Although, however, the law court was convinced of the Cypriot origin of only 173 artefacts, their return was not made possible because of the difficulty of also finding similar evidence for the rest. 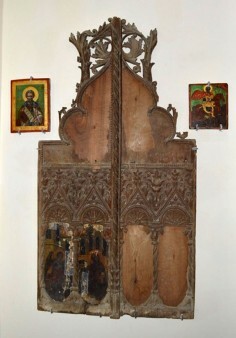 On September 23rd 2010, after a legal dispute of 13 years, the Munich law courts ruled that the Cypriot treasures found in Dikmen’s possession should be returned to Cyprus. In November of 2010, Dikmen proceeded to appeal. On March 18th 2013, Munich’s court of appeal agreed to a part of the religious treasures being returned, thus vindicating Cyprus. 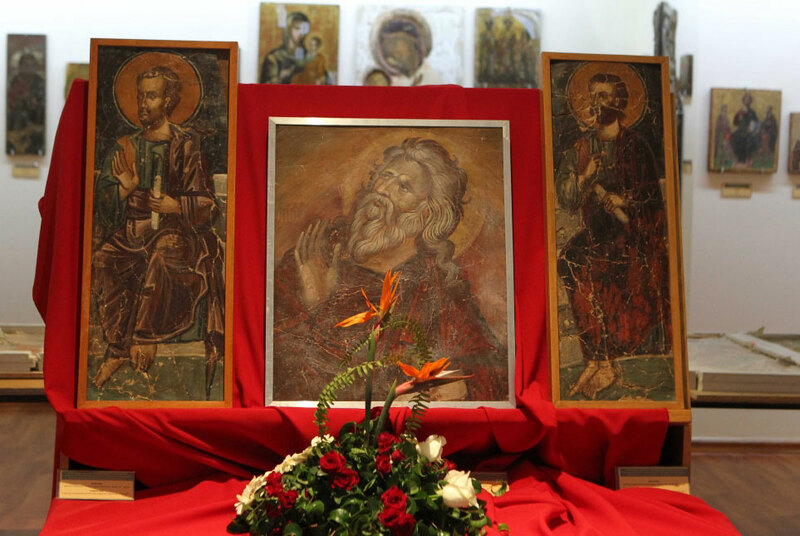 On November 12th, in a modest ceremony held at the Byzantine Museum, the Cypriot government and the Church of Cyprus came together to welcome back the greatest ever number of repatriated icons, wall paintings and mosaics from almost 50 churches of occupied Cyprus. Approximately 80 artefacts are expected to be repatriated, mostly archaeological treasures, found in Dikmen’s possession in 1997. 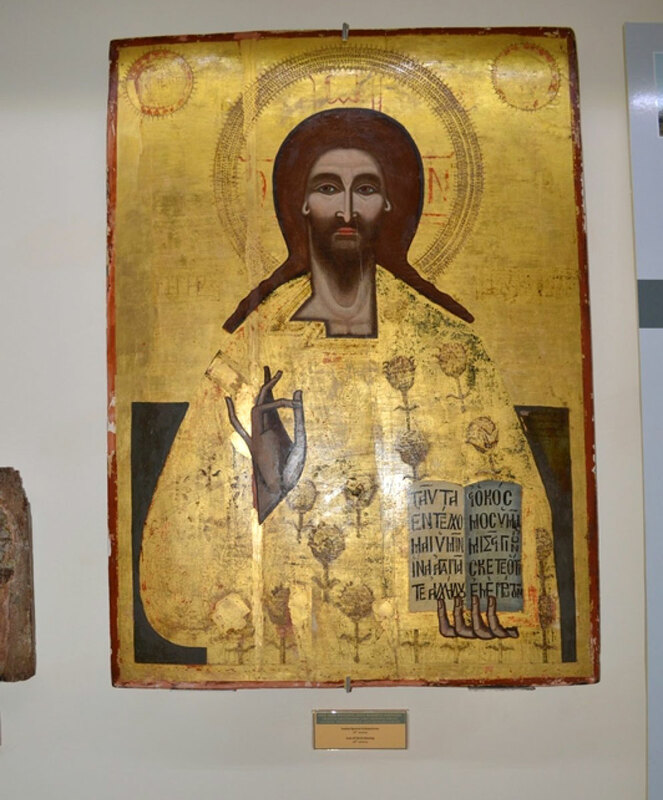 The Byzantine Museum of the Archbishop Makarios III Foundation which opened in 1982, is the result of the efforts made over many years by the Church of Cyprus to preserve and promote the byzantine and post byzantine culture of our country. The part played by the Byzantine Museum, as keeper of our cultural heritage, is fourfold. First, it conserves and preserves both the existing treasures but also all those gradually repatriated from abroad, in collaboration with the Conservation Workshop of the Archdiocese, the Antiquities Department as well as conservation workshops abroad. Second, it promotes and participates in the younger generations’ information and awareness. These goals are achieved through educational programs in collaboration with the Ministry of Education and Culture, as well as lectures, guided tours, radio and television broadcasts for both the Cypriot public at large and foreign visitors to the Museum. Third, it promotes the issue of plundered treasures in corresponding museums abroad through workshops and exhibitions in collaboration with the Department of Antiquities but also by offering information to interested parties. Fourth, it plays the part of an unofficial observer with an aim to locating plundered treasures abroad so as to denounce them and promote public awareness.